Enjoy plant power. Soya with yogurt cultures. Source of calcium. Free from dairy and gluten. 100% plant-based. Rich in plant protein. Naturally sugars free and low in fat. Vegan. 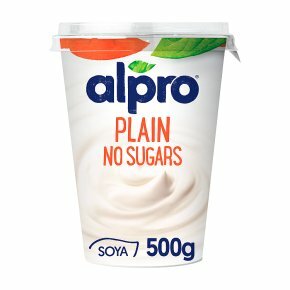 Discover the goodness of plants: Alpro® Plain Unsweetened, a delicious plant-based alternative to yogurt that's naturally sugars free. With its naturally mild taste, try it on its own, with fruit or for cooking and baking. So many possibilities to enjoy everyday. Nutritious and a source of high-quality soya protein, which contributes to muscle maintenance.